You'll love adding this plug-in swing arm wall lamp with Possini Euro Design white linen shade to any homey living space. This sleek brushed nickel finish wall lamp offers contemporary styling. The swing arm feature allows you to put light right where you need it. Simply attach lamp to wall and plug into any standard outlet using provided cord. It’s topped with a white linen drum shade. From the Possini Euro Design Lighting Collection. Shade is 10" across the top, 12" across the bottom, and 8" high x 19" extension x backplate is 4 1/2" wide, 7" high. 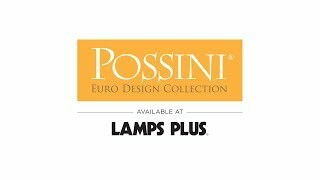 From the Possini Euro Design® Lighting Collection. Featuring a full-range dimmerthis plug-in brushed brass finish swing arm wall lamp is paired with a creme fabric bell shade and brushed brass metal cord cover. Great for seating areas or in the bedroomthis contemporary swing-arm wall lamp is paired with a custom made-to-order eggplant textured polyester shade. Warm light and soft color from this peacock blue table lamp create a welcoming glow in any living area.